Conservative residents in Orange County, a wealthy enclave in Southern California just south of Los Angeles, are furious after supervisors voted to spend over $70 million on permanent housing for the homeless. 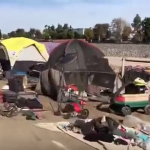 Even worse, homeless people may be temporarily housed in tents inside three conservative Orange County cities including Laguna Niguel, Huntington Beach and Irvine. The temporary camps which could include actual tents being set up on county land has local residents infuriated. In response, Irvine Mayor Don Wagner called an emergency city council meeting Tuesday evening to discuss options, including filing a lawsuit. The Gateway Pundit spoke to a married couple who will be attending the emergency city council meeting Tuesday evening. The couple, who wish to remain anonymous said they are furious with the County’s decision to set up a ‘tent city’ near their home.